Novo Cinemas creates cinematic experience hubs to provide every customer with a lasting memory. Novo brings movies to life, letting guests choose from 2D, 3D, 4D, IMAX with Laser, ATMOS and luxury 7-Star VIP suites for their comfort. We commit to providing communities with a personalized and outstanding entertainment experience placing cinema-goers at the forefront. We understand that for us to succeed, we need our partners to succeed. Therefore; we’ve adopted our exclusive “Virtuous Circle of Growth” approach, which puts the mutually beneficial growth of the Real Estate Development at the center of what we do. Attract High Spending Footfall: Each year, Novo cinemas attracts over 6 million movie fans with spending power to a variety of real estate developments, generating valuable traffic for retailers. Strong brand image: Novo Cinemas is a premium brand in the region, the largest and most innovative movie theatre in the Middle East. Having Novo as one of the brands in any project will reflect a premium mall image. Strong Brand Reputation and a proven business model: Benefit from Novo’s strong brand name and established base of loyal customers. 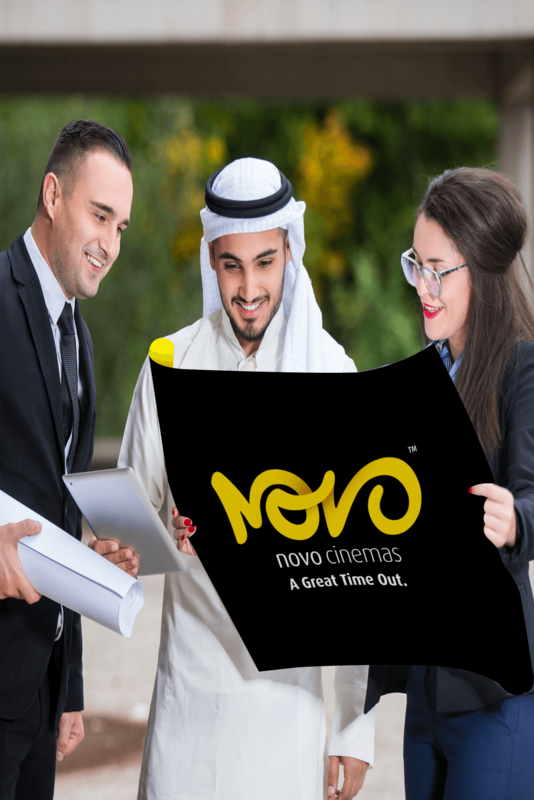 Brand Affiliation and strategic partnerships: Novo Cinemas is affiliated with prominent brands such as Qatar Airways and Coca Cola. Moreover, Novo partnered with various international cinema suppliers such as IMAX, OSN and others. Influential Relationship with Key Studios: Strong relationship with studios, and own Gulf Film distribution company enabling us to secure exclusive movie premieres and activations. Connect to our state-of-the-art Mobile App, Website and social media channels, which are used by thousands of loyal customers in Qatar each month. Industry Expert Support Team: providing our partners with ongoing support and training programs, seminars and workshops.